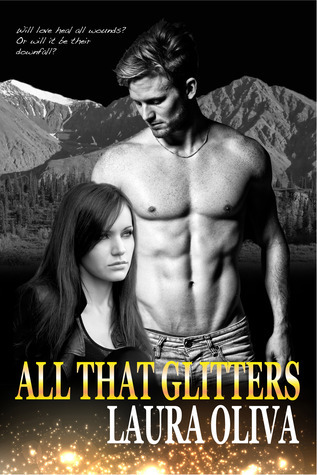 “All that Glitters” is a good, solid, romance novel with a twist. Ethan is tough, handsome and troubled. Ava is beautiful, unsure and looking for something intangible. On paper they work but, of course, stir in a baddie who wants the things that some newbie cowhand has the audacity to claim. Ethan gets everything. The pretty new girl in town, luck in the search for gold all fall into Ethan's lap. Worse, he gets admiration from the baddies father. As with the best baddies, I felt sorry for the one in this novel.There were elements of the novel that could have been more developed. The author gave Ethan a pretty solid back-story but left Ava a mystery. The reader doesn't get a sense of what she’s done since going to live with her grandmother in Seattle when her mom died. We know that she left her grandmother's home early and became a musician somewhere along the line and a few more lines in her discussion with Ethan could have fleshed her out a bit more. I also wondered, at the start, if Ava had dived before. Her purpose in coming to Nome was to act as a diver for her father’s boat and the description in the first scenes underwater was actually a very good description of an inexperienced diver. I am not an experienced diver but I do know that diving in water that is near freezing takes skill and training. As an aside, A&E has recently commissioned a show about gold dredging in the Bering Sea that I wasn’t interested in seeing until I read this novel.In all other aspects, Oliva seems to have gone to a great deal of research for this novel. The setting is extremely well described. A reader gets an idea of the cold, harsh beauty of the region. The isolation and difficulty of the winters. Ava's native grandmother is a character who lets the reader know that life for the Alaskan isn't easy. To get tea she must trade with people in the much larger Anchorage. Inupiaq words are peppered throughout the text (there’s a glossary at the end). The characters attend a native whale hunting festival that was very detailed. Not only is Ava getting to know herself in the story-line but she’s embracing the part of her that is Native and that she left behind so long before.Oliva chooses perfect moments to inject the danger element back into the story-line. “Don’t get comfortable” she seems to warn us. She even takes that step allowing the baddie to take a life – uncommon in the genre. ARC was provided by the author in exchange for an honest review. For Jodie Rae's full review, visit http://fallinginfall.blogspot.comAll That Glitters is a quick, suspenseful romance that will keep you entertained. The story is set in Nome, Alaska, which is on the coast of the Bering Sea. I loved that the setting took place in Alaska. Here I am in Oklahoma sweating bullets with 102 degree weather, wishing I was in Alaska with a high of 50!Ava comes back to Nome to help her dad hunt for gold, but the story is not just about Ava rekindling her relationship with her father. She also meets Ethan, another gold seeker from Texas. Ava and Ethan are not the type of people to deal with their pasts. Their characters would rather run from their pasts rather than deal with them, but the two eventually find their true selves.“It had been a week since he’d ambushed her. She’d hoped the lack of contact would get him out of her mind. Instead, she felt like a junkie whose drug of choice was being withheld.”Laura Oliva wrote a compelling story with so much emotion for Ava and Ethan. I just could not wait to find out what was going to happen next in the story. You would think since the title is called All That Glitters it would be about the gold in the Bering Sea, but it's more about other valuable shiny things, such as love and life. Oh, let's not forget the steamy scenes between Ava and Ethan ;-)Side-note: I've seen the show Bering Sea Gold on the Discovery Channel, and Nome, Alaska is where it's located! I thought it was so cool to make that connection. Alaska provides the perfect backdrop for Laura Oliva’s contemporary romance All That Glitters. Oliva pulls you into her character-driven romance with realistic and believable characters.Rugged, strong, and part Inupiaq, Ava Faraday belongs to two worlds but doesn’t fit in either. Ava searches to find the place where she belongs. Having no luck away from home, Ava returns to Nome, Alaska, to join her estranged father and his crew on his gold dredge. Upon her return, Ava meets Ethan Calhoun, another gold dredger, who relocated to Alaska five years before. Oliva does a beautiful job of blending in Inupiaq words and ceremonies, which adds depth to this story. Ethan sympathizes with Ava and her struggles to find where she fits in. Ethan does his level best to help Ava overcome her worries, which endeared Ethan to me. Their quick-witted dialog while they are figuring out that they have feelings for each other is fun to read. The sexual tension between Ava and Ethan smolders until they share a sensual and scorching night of passion together. Along with the romance between Ava and Ethan, Oliva consummately develops the mystery surrounding the accidents on the dredges.All That Glitters with its appealing couple and suspenseful plot keeps you riveted to your e-reader right up to the emotionally satisfying conclusion.I received an eBook copy from the author for purpose of an honest review for The Jeep Diva. I was not compensated for this review, and all conclusions are my own responsibility. 4.5 StarsNome, Alaska is the one place Ava Faraday has been avoiding for most of her life. After she receives a letter from her grandmother, she decides to stop running and return home. She returns to help her father during the dredging season, but she doesn’t expect her life to change forever. Ethan Calhoun has finally settled into a place that feels like home. He has been successful in the dredging business, however some of the locals never fail to remind him that he is an outsider. Throughout the years, he has managed to control his worst fears, but unfortunately his past comes back to haunt him the day he lays eyes on Ava for the first time.Laura Oliva bursts onto the romance scene with her debut novel, All that Glitters. This book is chocked full of suspense and steamy scenes. While readers will fall in love with the majestic beauty of Nome, Alaska, they will be caught up in the bumpy emotional ride as the main characters learn to accept their own paths. Although some of the more intimate scenes are repetitive, the suspense will keep readers guessing until the very end. All that Glitters is a fast, easy and enjoyable book to read. Notes:A copy of this book was provided by the author for me to review.This review was originally posted on Ariesgrl Book Reviews. First time author Laura Oliva has produced a winner. She's chosen a unique setting; Nome, Alaska, and her spare but vivid descriptions give the reader a good sense of place. Her use of a smattering of local Native words adds another layer of texture.Raised in the lower forty-eight, Ava is returning to the place she called home as a child, carrying the baggage of abandonment by her parents; one through death and the other through neglect. Ethan, a gold dredger, has come to Alaska to escape his troubled childhood in Texas. He, too, has brought his emotional baggage with him. Neither feels deserving of the love they so desperately seek.Amidst danger from both nature and subterfuge, these two must also fight the feelings that both draw them together and force them apart.At 207 pages, All that Glitter is a short read, perfect for a weekend at the beach. The love scenes are hot and Ms. Oliva's way with words shine in her descriptive phrases. The two main characters are well drawn. My only wish would be for more flesh on the bones of the secondary players.Overall, this was a delightful read and a well written bargain for the price. There's talent here and I'm eager to watch it progress in future works. I usually do not read this genre, but I loved Laura Oliva's online persona so much I decided to give it a whirl. Ava's character reminded me of myself, too tough for love, too independent to settle down. Unlike the lead female character that I often associate in these type of books, she's sassy and witty. There's a great content to the book, suspense, humor and whiskey, not just your typical romance touch me here, touch me there. Wonderful debut! Lots of luck to the author! I've had this on my to read list forever and I'm glad I finally got to it. Laura Olivia is a solid storyteller. The plot was well placed the characters were interesting and the language was pretty solid. Love the way this author always delivers tension, excitement and characters that connect with you from the first page. This is an Alaskan adventure with great action and hot romance. LauraOliva - **CURRENTLY WRITING AS L.J.K. OLIVA**L.J.K Oliva writes urban fantasy and paranormal romance, with a heavy dash of suspense. She likes her whiskey strong, her chocolate dark, and her steak bloody. L.J.K. likes monsters and knows the darkest ones don't live in closets.